Having fielded the oldest starting XV in Namibian Rugby World Cup history at England 2015, coach Phil Davies is looking to bring young talent through in time for the next tournament in Japan. Player retirement announcements are a regular feature of the post Rugby World Cup landscape, as back-to-back winners New Zealand are all too aware. While the decision of Dan Carter, Richie McCaw, Ma’a Nonu et al to hang up their boots occupied most of the column inches - not that they’ve been overly missed if the new-look All Blacks' performances in The Rugby Championship are anything to go by - Namibia have also had their fair share of notable departures in the wake of their best-ever performance on the Rugby World Cup stage. Shorn of experienced forward trio of Johnny Redelinghuys, Jaco Engels and Jacques Burger, the Welwitschias are in a rebuilding phase although the foundations, says their wily Welsh coach Phil Davies, were first put in place during the tournament itself. “Part of our World Cup selection thought process was that we’d include younger players, who could hopefully carry on after the World Cup when Jaco, Johnny and Jacques retired," Davies said. Even with Engels' omission, Namibia still fielded their oldest ever starting XV at a Rugby World Cup tournament (29 years and 13 days), when they took on – and nearly beat – Georgia at Sandy Park in Exeter last October. Talisman and captain Burger equalled Hugo Horn’s record of 11 RWC appearances for Namibia in the match, and Redelinghuys edged towards becoming the first player from his country to win 50 test caps as the Welwitschias came within a whisker of getting their first tournament win, losing 17-16. There was, though, a nod to the future in Davies’ selection, with back-row Wian Conradie winning just his second cap off the bench. The succession planning has continued throughout 2016, and as is the case with the All Blacks, without any drop-off in results at senior level. The signs are encouraging, too, in international age-grade rugby, with a best ever finish of fourth at the World Rugby U20 Trophy in Zimbabwe. Namibia's place at next year's tournament was assured by their recent victory at the Rugby Africa U19 Championship. “Player cycles are very important, and that has been at the forefront of our decision making - to get the younger talented players through the system so that we generally get the average age of the squad down to 25-26 by the time of the next World Cup," Davies explained. Namibia’s players come from a host of different backgrounds, and Davies says bringing them all together as one “cohesive group” remains one of his biggest challenges – that and finding the next Burger (pictured). 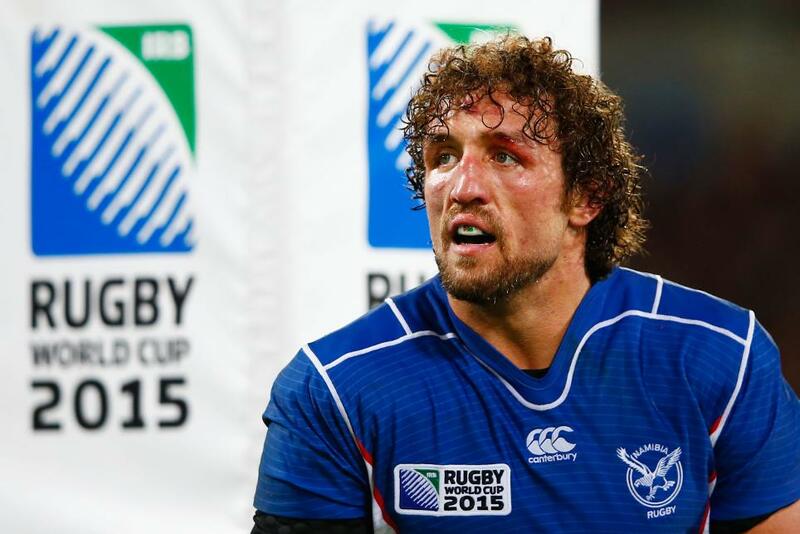 One of the few overseas-based professionals in the Namibia squad, Burger bowed out from rugby at the end of April having helped Saracens to the English Premiership and European Champions’ Cup double. He has since returned to farming, an environment that has helped rear many a Namibian rugby international. “We have a few fully professional players but the majority of players are either semi-professional, playing in South Africa or studying, or home-based, who we need to develop," said Davies.